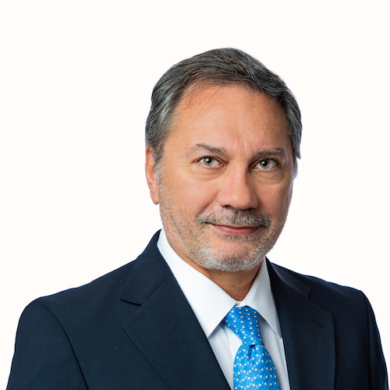 Alfredo W. Forti has more than 30 years of experience advising on international public affairs, foreign and defense policy, and human rights, among other practice areas. Mr. Forti served for seven years (2007-2013) as Vice Minister of Defense of the Republic of Argentina, implementing successful reform and modernization programs for the country’s international defense policy. He negotiated cooperation agreements with 31 countries; created the first Regional Center for Advanced Training in Peace Operations; equipped and launched the primary binational peace force in Latin America; and coordinated Argentine participation in UN peacekeeping operations. In 2003, he was appointed Ambassador to Honduras. During his three-year tenure, he focused on improving cooperation and trade. Honduras became the largest recipient of Argentine international cooperation programs, while Argentine exports to Honduras grew nine-fold. More recently, he was Senior Advisor to the Secretary-General of the United Nations, António Guterres, in charge of designing a new policy to fight sexual exploitation and abuse by UN military and civilian personnel in field missions. Mr. Forti has also served as Special Advisor to the Secretary-General of the Organization of American States on regional security and defense policy (2015-2017). Among various special assignments in crisis situations, Alfredo Forti was designated by the President of Argentina as a Special Envoy to carry out negotiations with the Government of Ghana for the successful recovery of a Navy Frigate, embargoed at the port of Tema (2012). He was also appointed as a Special Presidential Envoy successfully negotiating the resolution of a bilateral crisis with Cuba involving a dissident entering the Argentina Embassy in Havana (2004). In the human rights arena, Alfredo Forti has been a prominent activist in the broader Latin America truth and justice movement post-Cold War. In such endeavors, he has professionally advised the governments of Haiti, Peru, Honduras, El Salvador, Suriname and others in the design of mandate, structure, and implementation strategies of Truth Commissions charged to investigate past human rights violations. Alfredo Forti holds a Master’s degree in Public Administration from Harvard University and a BA Degree in International Relations from The American University, Washington, D.C.